Thanks to Jim Hutcheson for this week’s blog on family business in the White House. The Practitioner loves the idea of looking at world leaders from this perspective. If you want to do a quick tour of the top political leaders in your country that have family business connections, please send us your blog or longer article by going here (link to submission form). No doubt about it, leadership in democracies throughout the world is changing. The status quo of “politics as usual” is charting a new course. With the election of Donald Trump, some will wonder how family businesses fit into the changing political climate. But is this a new phenomenon? Not really – at least not in the US. Here is a quick review of how family businesses and the White House have intersected over the years. In the Republic’s early days, Presidents often led family businesses. George Washington was a prosperous Virginia planter, like his father, before and after becoming the first President. Part of Washington’s motivation for overthrowing British rule was chafing at royal regulations that hampered his business. The second President, John Adams, was the first in a string of chief executives who started as lawyers in private practice. Thomas Jefferson, like Washington, oversaw a plantation inherited from his father. In this century, George W. Bush ran the Texas Rangers baseball team before moving to the White House. In recent years, occupants of the White House have tended to be career politicians. Barack Obama worked in corporate research and community organizing before winning an Illinois State Senate seat, but never had a family business. Bill Clinton taught law before being elected Arkansas Attorney General and launching his political career. Clinton’s predecessor, George H.W. Bush, had a career in the oil business before embarking on the series of elected and appointed political positions that culminated in his stint as President. Ronald Reagan famously starred in Hollywood, Jimmy Carter farmed peanuts, Gerald Ford made a career of politics, Richard Nixon practiced law and Lyndon B. Johnson taught school. You have to go back to John F. Kennedy for a president who, like Trump, was a member of one of the country’s wealthiest families. Like JFK, Trump will be in the unique position of being both leader of the Western world and a leading family business executive. Perhaps most significantly, Trump is by far the most successful and influential family business leader to ever occupy the office. Few think that, even with the assets of the Trump organization tucked into a blind trust outside the president’s control, Trump’s White House tenure will mean anything but greater prosperity for his family business. What if anything this might mean for other family businesses remains to be seen. Perhaps Trump will initiate looser regulations that ease family business operations or cut estate taxes to smooth intergenerational wealth transfers. Looking back at the lengthy connection between family business and the White House provides little direction. In short, stay tuned! 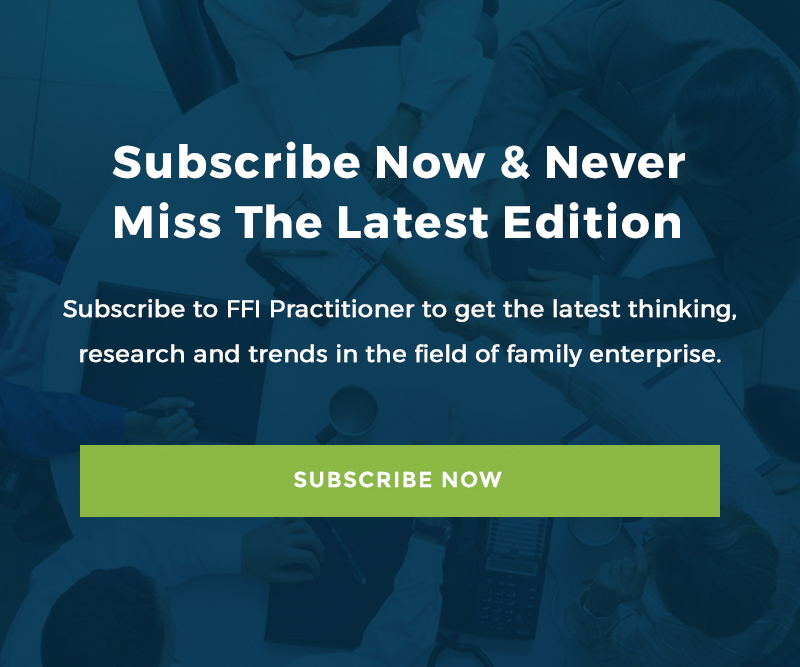 Although there may be a popular perception that family business hasn’t kept up with the rest of the world, in fact, family business leaders could be said to have been running the world for a long time. James O. Hutcheson, FFI Fellow and recipient of the 2009 Richard Beckhard Practice Award, is president and founder of ReGENERATION Partners in Dallas, TX. He has more than 40 years of hands-on family business management and family business consulting experience. Jim’s family has owned and been actively involved in the daily management of two family businesses: Olan Mills, Inc., one of the world’s premier photographic companies, and Peerless Woolen Mills, later a division of Burlington Industries. He can be reached at [email protected].